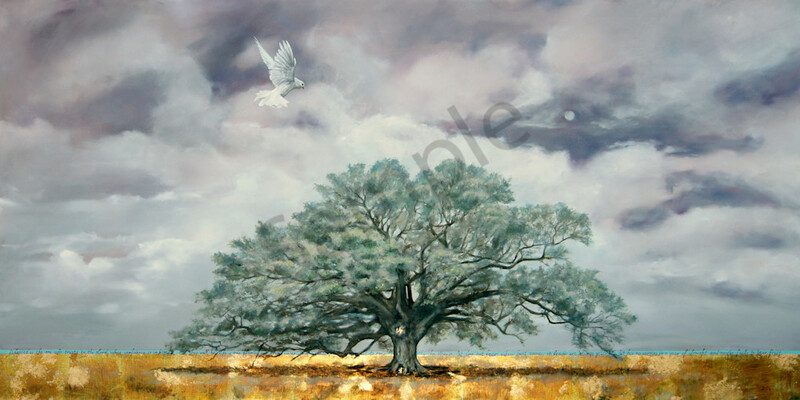 This painting was first commissioned as a depiction of a dove, then, almost as an aside, I was asked if I could also include a reference to one of my clients' favorite scriptures, Jeremiah 17:7-8, which reads: "Blessed is the one who trusts in the Lord, whose confidence is in him. They will be like a tree planted by the water that sends out its roots by the stream. It does not fear when heat comes; its leaves are always green. It has no worries in a year of drought and never fails to bear fruit." I knew the painting had to be about the tree - solid, rooted, alive, flourishing. It became almost a portrait. And yes, the dove is there, always, but here in sort of a proud, celebratory acknowledgement of this icon of faith below it. The gold leaf, representing the divine source of their faith, shimmers and changes depending on the viewers perspective, reflecting the intimate, personal connection between God and man/woman. This painting was first commissioned as a depiction of a dove, representing the Holy Spirit. Having just finished another commission that included three birds—one a dove—I thought I was becoming an Audubon artist! Then, almost as an aside, I was asked if I could also include a reference to one of my clients' favorite scriptures, Jeremiah 17:7-8, which reads: "Blessed is the one who trusts in the Lord, whose confidence is in him. They will be like a tree planted by the water that sends out its roots by the stream. It does not fear when heat comes; its leaves are always green. It has no worries in a year of drought and never fails to bear fruit." Because I saw in this metaphorical tree the lives of my friends Keith and Christine, I knew the painting had to be about the tree - solid, rooted, alive, flourishing. It became almost a portrait. And yes, the dove is there, always, but here in sort of a proud, celebratory acknowledgement of this icon of faith below it. The gold leaf, representing the divine source of their faith, shimmers and changes depending on the viewers perspective, reflecting the intimate, personal connection between God and man/woman.